Lisia is a Supporter that does just that – in fact, it can nab you any 2 <Prism> cards from your deck to your hand. Fun fact: you also don’t have to end your turn the way Steven’s Resolve does. So now we have a means of grabbing singular one-ofs in many decks with ease. This is a pretty big deal, considering the power level of the <Prism> cards is pretty high. It’s one of the main reasons for their unique limitations – you can only run one copy of each <Prism> card per deck, and it gets put in the Lost Zone if it would be sent to the discard pile. On the flip side of that, they each have pretty powerful effects – for instance, Latias <Prism> from a few days ago can power up your whole Bench of Dragon Pokemon with ease! Lysandre <Prism> can remove some of your opponent’s cards in play, Cyrus <Prism> can bounce back most of your opponent’s Bench, Diancie <Prism> can boost your Fighting Pokemon much more readily, and your Ultra Beasts will usually have a Beast Energy <Prism> nearby to dish out even more damage! Sounds like the perfect card, right? Well, there is a small catch, and that mainly comes in deckbuilding: not every deck is going to want to run the max number of Lisia in order to get upwards of 8 <Prism> cards. Really, most decks don’t run anywhere near that number of <Prism> cards, since most of them are designed with a specific deck in mind – Lysandre <Prism> works only with Fire decks, Diancie <Prism> only works with Fighting decks, Cyrus <Prism> can fit in either Water or Metal decks, etc. It’s not feasible to run every single <Prism> card in your deck, unless you feel like losing in a flashy way. So maxing out on Lisia is purely unnecessary, but then how many Lisia would you run? At the moment, that number is likely 1 copy to grab the 1 <Prism> card you need, and that could basically put it in direct contention with that card. If you draw Lisia first, great! You get your <Prism> card more easily! But if you draw the <Prism> card first, Lisia could get weaker or become unplayable, a dead card with no real resolution to it. It’s almost a risk to put Lisia in the deck just for the consistency, and it leads to a sort of “boom or bust” potential for the card. I think though that with more <Prism> cards, Lisia does stand to benefit more in the long run, even at only 1 copy in any <Prism> deck. It’s going to be a matter of playtesting, and it’ll heavily depend on whether or not we see more <Prism> cards in the future; I can imagine Buzzwole-GX will want to run at least one copy to nab both Diancie <Prism> and Beast Energy <Prism> in one go, but outside of that, it can be a big risk. Not to mention it does take up your Supporter slot for the turn, which could put a kink in your plans if you want to combo it with Cyrus <Prism> or Lysandre <Prism>. We’ll see what happens as time goes by, but I can definitely say that we really needed a search card for these specific one-ofs! And it’s good to see Lisia take the reigns on that! Arora Notealus: Lisia was personally my #1 of the set, and it’s no surprise why exactly – she can do a lot of things for a lot of different decks! But the major hurdles are going to be the total number of <Prism> cards that get printed in the upcoming sets and what decks will be playing those <Prism> cards. If every Type or kind of deck has at least 2 <Prism> cards to put into it, I can imagine Lisia seeing a tremendous amount of play as a means of getting to those cards, but otherwise she’ll mainly be seeing niche use in other areas. It’s the sort of thing where it could be extremely impactful, but it needs a lot more than just the few cards here to justify it. At least Dragon decks can make a lot of use out of her, with Latias <Prism> and Latios <Prism>, as well as some upcoming support in the next set. Next Time: And topping the list off is someone who’s no stranger to being on top of the list. Pokemon Contest related subjects don’t translate to the TCG well, and they don’t make much of an appearance. However, Pokemon Contest Hall (Platinum Rising Rivals) comes pretty darn close when it comes to effects that tries to relate to Pokemon contests. Searching your deck for a Basic Pokémon and put it on the bench, as well as attaching a Pokemon Tool to that Pokémon? That’s like sending Pokemon out and dressing them. The contest aspect are in a decent amount of games like RSE, DPPt, and ORAS. Speaking about ORAS, we got a character that is a very skilled coordinator that makes you interested in Pokémon Contests. And she has an Altaria that can Mega Evolve on stage if enough attention to the audience is directed. She also gives you Lucarionite if you beat the Master Rank. Thank goodness XY gave you a freebie, because the method of getting it in ORAS is irrational, making you experience another genre outside of battles. Sun & Moon is on a similar boat, needing 64 battle points from Battle Tree. Irrationalities aside, that character in question is Lisia, our second best card of the set! Apparently, her effect isn’t related to Pokemon Contest at all, which is okay because she has a better effect instead of fiddling with contest effects. What does she do instead? You get to search your deck for 2 Prism Star cards and put them onto your hand. This……….is actually good! Prism Star cards are hard to draw into because you’re limited to one Prism Star of the same name, so fetching two of them alleviates that problem except when a certain Prism Star Card is prized. The one deck that I could see that wants to use her is Fighting decks. Grabbing a Beast Energy and Diancie enables your Buzzwole-GX to get a single attachment and a damage boost, to the point where you can do 80 damage to the Defending Pokemon and 30 damage to one of your opponent’s Benched Pokemon in a single turn! And that’s before factoring Choice Band or any other damage boosting cards. Don’t think about her being limited to just one deck. 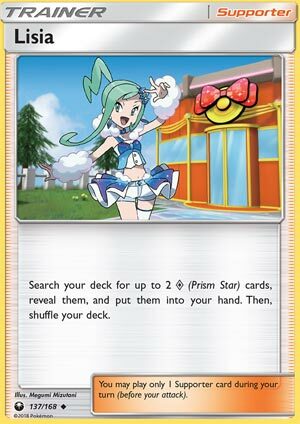 As long as you got any Prism Star cards in your deck, then Lisia can easily search you some, whether it be Energy cards, Pokemon, or Trainers. However, if you fetched a Prism Star Supporter card, that may badly telegraph your opponent about what you’re going to do next turn (outside of Dual Brains Magnezone from BW Plasma Storm). And your opponent gets a chance to respond by disrupting your hand. Overall, this is a card you can consider, at least for Standard and Limited, because Expanded still has some of the big draw supporters that schools most Supporter cards due to getting as much cards as you can, even though it nets you random cards. Side note: I can imagine Lisia with Buzzwole and Diancie in Ultra Space giving out the best performance. However, I don’t feel like drawing exactly what I think of; I’ll leave that imagery to yours. Imagination aside, you can consider using her via one or two copies in your deck just because some decks don’t carry too many Prism Star cards. Most of my colleagues on Pojo here, however, had a much higher opinion of this card than I did (not that that would have been difficult as I didn’t even include it in my top 25), but let’s remember what I mentioned yesterday: they have a history of collectively being right about cards that most of us initially don’t think much of. Shrine of Punishments and Dawn Wings Necrozma GX are the two examples I’ll cite as evidence of this. Let’s also consider that it doesn’t seem like we’ve seen the last Prism Star card yet. We all know that Pokemon goes through phases where they issue these special cards – the Breaks or dual type Pokemon are the most recent examples of this – and that these phases usually last a year or so. Many of us have compared these Prism Star cards to the Ace Spec line of cards from a few years back. If you’re not familiar with Ace Specs, these were about a dozen or so cards that were Item cards, but you could only carry one of them in a decklist. Prism Star cards have the obvious similarity in their singularity, but maybe the more important comparison is the fact that of all of the Ace Spec cards, only two (and some people would argue just one) were the most powerful and frequently used. I believe that when we look back at the Prism Star card era three or five or ten years from now, we’ll see the same thing: several Prism Star cards, with only one or two of them being the most potent and impactful. And I don’t think we’ve seen that #1, absolute best Prism Star card yet. I think that at some point over the next six months or year, we’ll get a Prism Star card that will absolutely change the game. It will be meta defining: maybe it will be a Pokemon with an ability to nullify the effects produced by Stadiums, or maybe it will allow you to put three damage counters on any of your opponent’s Pokemon. Maybe it will let you grab an Energy card out of your deck and attach it wherever you want, or maybe it will let you draw until you have six cards in your hand. Maybe it will even be the white whale of Pokemon cards, a Pokemon with the ability that allows it to replicate abilities. I don’t know what it is – or what they are – but when they do come down the pipeline and drop into the meta, Lisia will become a four of in every deck. Or maybe it won’t happen, and Prism Star cards will fizzle away… but I doubt it. I know we have pretty good line of sight to what’s coming over the next couple of months, but I just feel really certain that some really good Prism Cards are just over the horizon.